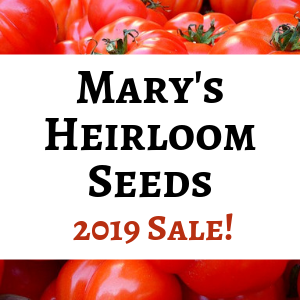 As they pulled into our driveway, I could see that the seam over the driver’s side of the cab was coming apart and rotten wood was clearly visible through the crack. The photo above was taken after my Dad started removing the seam covers. I pointed out the crack to my parents and my Dad started right away on the job of ripping the rotten wood out of the interior. The more he removed, the more worried we were. The entire floor of the sleeping compartment over the cab had to be removed. Then we could see that the walls were rotten too. You can see the rotten wood all through the sleeping compartment. Pretty soon Dad started removing the vinyl outer covering. He tried to save it to reapply it later, but it began to rip. The vinyl hasn’t held up well over the years and we began to realize that it would also have to be replaced. The RV repair shops in town guesstimated that it would run over $500 and would take a couple of weeks to order. We were starting to really get worried. Trying to save the vinyl skin. Pretty soon, the whole skin covering the front of the sleeping compartment was removed and Dad, Tom (my hubby), and Joe (our son) were working on rebuilding the structure. They also had to remove the three windows from the compartment. Dad decided not to put the front window back in. The clearance lights on top were removed and set aside…unfortunately one broke and the wiring needed to be replaced too. Removing the skin to get all of the rotten structure out. They used some scrap wood and extra plywood from our garage, and we went to the lumberyard for 2x 3s, and a variety of nails, screws, and brackets. We picked up a variety of different kinds of caulk, including special caulk for RV roofs and siding. I found a website that recommended a sealing tape called Eternabond that sounded like a good product to have for sealing up the outside edges and we picked that up at an RV dealership that sells parts. The rounded part of the front structure was cut from a 2″ thick scrap board and Tom used a jigsaw to shape it as close to the original as he could manage. Dad cut 2×3″ lumber to size for the compartment structure and everything was screwed into the original frame. They cut plywood to size for the flat front part of the RV nose and fit it in place. Starting to rebuild the structure. In this photo you can kind of see how my Dad fashioned the support structure for supporting the floor of the sleeping compartment. I’m sorry I didn’t take more photos so you could see the structure better. My bad. Once the supporting structure was completed, sheets of foam insulation were installed under the plywood platform. My Mom cleaned the goop off of the windows and treated them with Rustoleum paint to prevent them from getting rusty. Then she started cutting sheets of foam insulation to fit under the plywood platform and over the FRP sheets that Dad and Mom cut to fit. The FRP sheets were glued in place with Liquid nails and also screwed into place to help them stay put. 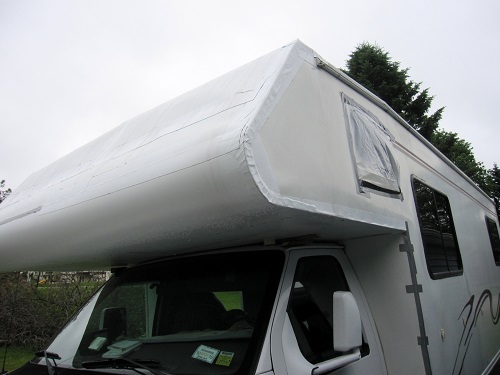 They provide the outer water-resistant covering on the underside of the nose of the RV. Once the structure was in place, Dad and I went back to the hardware store and picked up a 50′ roll of aluminum coil trim (normally used for covering the sofit of your roof and other such projects) and some 8′ aluminum angle brackets. Dad cut the aluminum coil trim to the proper lengths and screwed and caulked it in place to cover the top, front, and rounded part of the RV nose. Once the aluminum covering was complete, Dad used the Eternabond tape to cover all of the seams to waterproof them. Then he cut the aluminum angle brackets to fit over all of the straight seams to help hold them good and strong. These were screwed in place. Things were really starting to shape up! Unfortunately, the refrigerator wasn’t working properly when run on propane rather than AC current, and the carbon monoxide detector kept beeping. Also a lug nut was missing from a tire. So we found a local shop that works on RVs and managed to get an appointment to take the beast in for the final fix-ups. They determined that the house compartment batteries needed to be replaced and while they were looking at it, we asked if they would just check the redneck rebuild job to be sure that my parents could get back on the road the next day. With the final OK from the shop, Mom and Dad loaded up the beast and headed back down the road on their trip to Alaska…and we left on our trip to the Upper Peninsula of Michigan! Who says Life on a Homestead isn’t Adventurous?! PS: Just in case you are getting ready to try your own redneck rv rebuild…There are some things that you should be aware of. 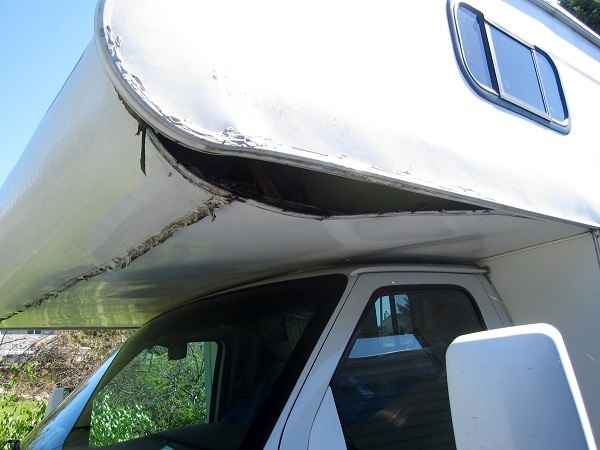 First of all, changing the structure of your RV could make it un-insurable. My parents called their insurance company, but could not get confirmation in writing that their insurance will cover them if something goes wrong. In addition, my husband is an engineer and he cautions that modifying a vehicle that will be driven down the road could be a recipe for disaster. If you don’t know what you are doing, you should probably take it to a professional. 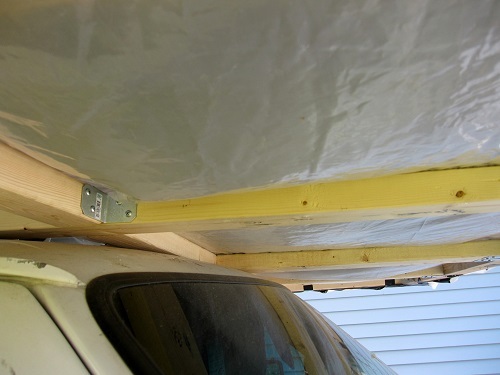 If you are going to try this yourself, be careful not to change the weight distribution too much, and be sure that the materials you use will hold up to high winds as you head down the road. You don’t want to have stuff flying off and hitting the unsuspecting travellers behind you. I would feel terrible if someone was injured by debris from a home rebuild project. My parents felt that they were safe driving their rv down the road, and I hope they are. But I still worry about them as they drive through Canada and up the AlCan highway. I would really prefer that they had sold their rv and taken another form of transportation. That’s a really impressive remodel 🙂 Have fun in the UP, I’m still working towards my permanent trip there. It is beautiful country. Wow! Great job. We’ve had to do something similare–but not as dramatic as your project– in the past. Well done! I hope your parents have a safe & fun trip. Little late in responding (didn’t know you did) But they were right at home. He left the driving compartment & just walled it off a bit, so we could drive it if we wanted. Since it no longer has a gas tank, hubby hasn’t been overly impressed with driving it with a gas can in place of the tank, even though we drove it a 1/2 mile from their home to ours. 🙂 It has a couple nesting boxes along the back where the couch/bed/dining area was. The ‘human’ door was left for us to access. But he created a chicken door (& ramp) for them to go in & out. And Roosting bars in a couple areas. Half of the flock immediately took to it & the other 1/2 preferred to stay under the carport to roost. A few years later, we’ve moved it (towed it) to our own home & they all went to RV coop at roosting time after they were let out….something they hadn’t done. 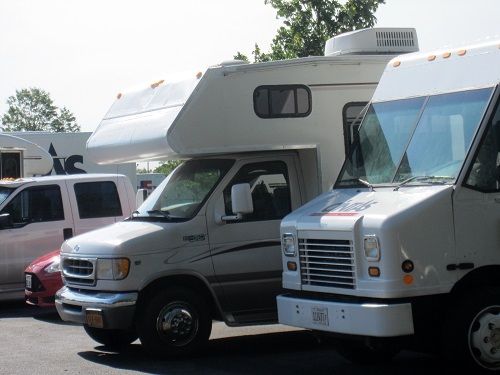 How’d your parents’ RV fair on their trip & back? Oh gosh, thanks for getting back to me! I bet it makes a pretty unique coop! Thanks, Bobbie Jo! I bet you would have loved going on that trip 🙂 I hope you get to go someday. We are hoping to drive to Seattle to see my brother in a couple of years and then fly to Fairbanks. Not sure about the drive up the AlCan Highway. I hope you Grandparents are staying well. Thanks for sharing! I lived and worked many Years in Dawson Creek, B.C. I;s sure they will take a photo of the Mile 0 sign post of the Alaska Highway. I drove the Alaska highway and it is beautiful. It has been about 25 years now since I last drove to Fairbanks, and then on to the coast and a visit with an Aunt. I drove an old truck and an old camper and made it. I’m sure they will be fine. Just very expensive for gas as you get further north. But Alaska prices dropped and were much better. Hope they have a safe and wonderful trip.